Kroger has been a valued sponsor of Susan G. Komen Greater Fort Worth since 2007. As true for so many organizations, Kroger employees and their families have been touched by breast cancer. 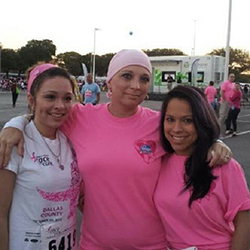 We recently spoke with Helen Garcia, Kroger Asset Protection Manager, from Cedar Hill, about her cancer journey. Helen Garcia had volunteered at Susan G. Komen events, but little did she know she eventually would join the ranks of other Kroger employees who are breast cancer survivors. The Kroger Asset Protection Manager, who had never had a mammogram, discovered a lump in her breast in June 2012 at the age of 41. Encouraged by her children to seek answers, she had a mammogram but it didn’t show anything due to the location of the tumor. In July, following subsequent ultrasound and biopsy, she was diagnosed with Stage 2A invasive ductile carcinoma with microcalcification. To treat her 2 ½-inch aggressive tumor with its specific 48-50 percent chance of re-occurrence, Garcia chose aggressive therapy– a double-mastectomy and eight rounds of chemotherapy administered every other week. Many at Kroger didn’t know about her illness since she wore wigs and received treatments late in the week for weekend recovery time. But because she was open about it, she discovered Kroger co-worker survivors and survivors she met through Komen who were willing to help answer her questions and offer other support. Today, seven years later, she is cancer-free and providing that same kind of support to Kroger co-workers who since have received breast cancer diagnoses. Garcia recommends participating in the Komen Greater Fort Worth MORE THAN PINK Walk this April 27 at Clearfork, for which Kroger is the local presenting sponsor. ⇐ Your spring cleaning can create summer healing. Donate a car to Komen!